Blurb: A story about family, love and finding magic in everyday life, Days of Wonder is the most moving novel you'll read all year. Review: The first thought that came to my mind after finishing this book was, wow what a magical story this was. I am pretty sure I won't make this book justice with my review but I'm gonna try. Days of Wonder is a stunning story. It's an ode to theater and fairytales. To the magic of stories and how they inspire people and change lives. It's tender, it's sweet, it's funny and it's heart-wrenching. I haven't felt such deep emotions with a story in so long. I was completely enthralled with Hannah's story. She was such a strong character. I loved her dark humour, her strength and her determination. The story was narrated in alternated chapters by both Hannah and her father, Tom, so as a reader you got to know them both quite well. Tom was also a fantastic character. His love for her daughter and his theater shown through the pages of this book. Supporting these amazing main characters, there was a whole cast of secondary characters. The amateur theater group was like a little family, they all supported each other and were always there to celebrate their joys but also to mourn their loses. And then, there were Hannah's friends from high-school and the comic book store. They all added their own touch to the story and I came to love them all too. 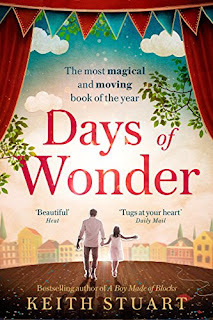 Days of Wonder stole a tiny piece of my heart that I don't think I'll ever get back. After I finished reading it, all I wanted to do was start all over again and go back to these characters. It's one of those rare books that make you feel privileged to have read it. I definitely recommend this story to everyone looking for a bit of magic.